On Sept. 12, 2018, 250 labor leaders and others met in Berkeley at a conference hosted by the Labor Center to discuss best practices in worker-friendly climate policy. The meeting was the culmination of years of organizing and research by labor to identify best practices, make alliances, and change the green economy. Speakers discussed labor-friendly climate policies at home and around the world, including California, Washington, Canada, Norway and South Africa. Their consensus was clear – California and the world must take major steps to reduce greenhouse gas emissions and protect our climate, but workers can and must be key beneficiaries of this transition. The green economy can produce good, family-supporting jobs with access for all, or it can worsen the overall economy’s yawning gap between the rich and low-wage gig workers. The overwhelming evidence from all the speakers was that while the track record remains uneven, much progress has been made. Labor unions have played a central role in building coalitions to advance an aggressive climate policy agenda that also protects and creates good jobs. This panel discussed the role of California’s building trades and other unions in supporting climate action, and evaluated the state’s progress in creating a toolbox of “high road” labor policies. The key challenge for development of a climate agenda that labor can support is ensuring that workers in high-emissions industries do not lose their livelihoods. This panel explored best practices from around the world in managing the transition away from fossil fuels so that workers benefit from a low-carbon economy. 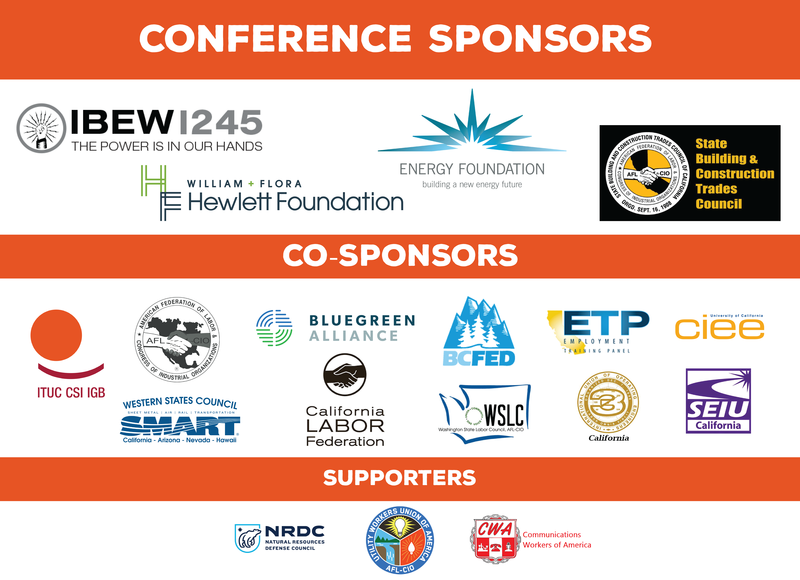 Labor unions have undertaken serious efforts to join forces on climate policy with environmental justice organizations as well as other community, environmental, and public health groups. Panelists discussed how they have worked to create and strengthen broad coalitions. Fires, floods, hurricanes, droughts, and other calamities are already occurring more frequently because of climate change. How are labor unions helping society adapt to the “new normal”? Reducing the use of energy in buildings is a key climate goal. This panel discussed labor’s efforts to build alliances, engage workers, and create good jobs in energy efficiency in the United States and Canada, paying particular attention to the different challenges faced in the public and private sectors. This panel explored how unions have positioned themselves at the cutting edge of workforce training in their industries and how they have helped their members adjust to changing skill needs. Panelists also discussed how unions have played a role in broadening access to good jobs for workers from historically marginalized groups. This panel considered labor’s engagement in developing policies to increase the use of mass transit and to shorten commutes through transit-oriented development, while grappling with new challenges such as the affordable housing crisis, ride-hailing services, and self-driving vehicles. Renewables and a “smart grid” can support and/or destroy good jobs, depending on the laws and regulations being created for the rapidly-changing electricity sector. This panel examined the role unions are playing in power policy development in California and New York, including in emerging technologies such as offshore wind and the electrification of transportation. The manufacturing of low-emission and zero-emission vehicles is an expanding industry, and unions are fighting to ensure that the jobs created are good ones. Panelists discussed how unions can expand their role in advanced supply chains, push for “fair and responsible” requirements in clean vehicle rebate programs, and use high-road procurement strategies. Lowering emissions from the goods movement industry is a critical goal for climate policy, but the trends of deregulation, subcontracting, and automation are deeply eroding worker wages and conditions. How can trucking, rail, warehouse, and port unions develop strategies to protect and improve their jobs while supporting a cleaner industry? Dion Abril is the executive administrator of the Western States Council of Sheet Metal, Air, Rail and Transportation Workers (SMART) of California, Arizona, Nevada, and Hawaii. Graduating from the Phoenix JATC in 1994, Abril continued to learn through many positions in the HVAC industry ranging from journeyman, general foreman, superintendent, Local Union 359 business representative, and Local Union 359 business manager. In 2015, Abril relocated his family to Sacramento to further his career in the position of Western States Council Administrator, where his primary focus is to build relationships that will help to move the industry and members. Vincent Alvarez is president of the New York City Central Labor Council. He has served as a volunteer for the NYCCLC, coordinating hundreds of labor mobilization and campaign events on behalf of the federation’s affiliates, and was the lead organizer and marshal of the Labor Day Parade, the nation’s oldest and largest worker parade. Alvarez is the board chairman for the Robert F. Wagner Labor Archives at New York University; a board member for the Greater New York Councils, Boy Scouts of America; a member of the AFL-CIO State Federation CLC Advisory Board; a board member of the Murphy Institute for Worker Education and Labor Studies at City University of New York; and an advisory council member for The Worker Institute at Cornell. Doug Bloch has been political director at Teamsters Joint Council 7 since 2010. In this capacity, he works with over 100,000 Teamsters in Northern California, the Central Valley, and Northern Nevada in a variety of industries. He was the Port of Oakland campaign director for Change to Win from 2006 to 2010, and a senior research analyst at Service Employees International Union Local 1877 from 2004 to 2006. Prior to that, he spent ten years as a community organizer in various capacities with the Association of Community Organizations for Reform Now (ACORN) and the NGO Coordinating Committee for Northeast Thailand. Bloch serves on various boards and commissions, including as an appointee of Governor Brown on the Commission on Health and Safety and Workers’ Compensation (CHSWC), as well as the executive committees of both the Alameda and South Bay Labor Councils. Julina Bonilla, workforce development manager at the Port of Oakland, has a rich background in workforce and the development of strategic workforce initiatives. She served as the director for the Department of Labor Job Corps Northern California Outreach and Admissions contract, where she managed recruitment, enrollment, and job placement strategies for young adults in low-income communities. She began her career in education as a school teacher for the Oakland Unified School District and eventually moved into workforce development serving young adults throughout Northern California and Oakland. As the workforce development manager at the Port of Oakland, Bonilla leads efforts to partner with government agencies, schools, labor, and the community to promote initiatives and policies that prepare and place residents in Port-related careers. This includes workers from underserved communities that face barriers to employment. John Brauer has served California’s working men and women as the Workforce and Economic Development (WED) program director at the California Labor Federation. WED acts as a workforce intermediary on behalf of labor unions and workers throughout the state. Brauer has served six years as an appointee of Governor Brown on the State Workforce Development Board and its executive committee. He is also an appointee of Mayor Schaff to the Oakland Workforce Development Board. In addition, he serves on the board of the California EDGE Coalition, whose mission is to advance state policy and investments that create and sustain pathways into the middle class for all Californians, including individuals facing barriers to economic and social mobility. Brauer is also a board member of Tradeswomen, Inc., a nonprofit committed to promoting access and equity for women in non-traditional employment in California. Sharan Burrow was elected general secretary of the International Trade Union Confederation (ITUC) at its Second World Congress in Vancouver in 2010. Prior to this, she held the position of ITUC president since its 2006 Founding Congress in Vienna, and president of the International Confederation of Free Trade Unions since its 18th World Congress in Miyazaki in 2004. She is the first woman to have held any of these positions. Burrow studied teaching at the University of New South Wales in 1976 and began her teaching career in high schools. She has also served as a member of the governing body of the International Labour Organisation and a member of the Stakeholder Council of the Global Reporting Initiative. As part of her ILO responsibilities, Burrow chaired the Workers’ Group of the Sub-Committee on Multinational Enterprises. Barbara Byrd is secretary-treasurer of the Oregon AFL-CIO, and has been a union member for over 25 years. She believes that the state’s continued investment in the renewable energy economy would make Oregon a national leader, adding new jobs that can’t be outsourced. These would be good, family-supporting jobs with benefits that would create prosperity now and for future generations. As secretary-treasurer, Byrd oversees the Oregon AFL-CIO’s engagement in workforce training and green jobs/climate change. She is deeply involved in the intersection between labor and clean energy jobs, and wants to see the clean energy sector grow for the benefit of the members, and Oregon. Aida Cardenas, executive director of Building Skills Partnership, is the daughter of Mexican immigrant service workers. She has over 20 years of experience coordinating and directing educational, leadership, and organizing initiatives with janitors and other low-wage service workers. Cardenas’s leadership was crucial in bringing together representatives from several organizations, including industry employers and building owners, to expand a statewide training collaborative that incorporated Building Skills Partnership as a statewide nonprofit in 2007. She spearheaded the high-road collaboration between the Building Owners and Managers Association of Greater Los Angeles (BOMA-GLA), the United States Green Building Council of Los Angeles (USGBC-LA), and SEIU-United Service Workers West to form the Green Janitor Education Program (GJEP). Cardenas is appointed to the Workforce Development Board for the County of Los Angeles, and is part of the Council for Immigrant Integration. José Carmona is program director of California Campaigns at the Energy Foundation. Prior to joining the foundation, he was the chief of staff for the Assembly Democratic Majority Leader V. Manuel Perez (56th Assembly district) since 2008. In that role, Carmona advanced energy-related legislation, including a three-year extension of the Self-Generation Incentive Program; expedited permitting and siting of projects within the Desert Renewable Energy Conservation Plan; and secured funding for renewable energy workforce training in low-income and high unemployment areas of California. John Cartwright is the president of the Toronto & York Region Labour Council, representing 205,000 union members in every sector of the economy. A carpenter by trade, he led the Building Trades Council to achieve the highest level of unionization in North America. Cartwright has served on numerous public boards, is vice-chair of the United Way of Greater Toronto, and co-chairs the Toronto Community Benefits Network. He has been deeply involved in apprenticeship and training issues, as well as in crafting the “Green Jobs Strategy” with the Environment Committee of the Canadian Labour Congress. He recently authored the Greenprint for Greater Toronto, a plan for climate action and equity in Canada’s largest urban center. Lizeth Chacon is executive director of Colorado People’s Alliance. She was a founding board member of the Aurora Welcome Center, now called Village Exchange Center. In 2014, she became the executive director of Rights for All People, and in 2015 she led the union of Rights for All People and Colorado Progressive Coalition to create and become the founding executive director of Colorado People’s Alliance (COPA). Chacon is also the founding executive director of Colorado People’s Action (CPA). In 2016, she co-chaired the statewide ballot measure that successfully increased Colorado’s minimum wage to $12 an hour by 2020, and co-created the Statewide Immigration Resistance Table. Chacon continues to lead collaborative efforts on climate, economic, immigrant, and racial justice issues, and currently serves as the board president of People’s Action. Robert Collier is a research and policy specialist in the UC Berkeley Labor Center’s Green Economy Program, where he conducts research and outreach on workforce issues in the clean energy economy. In particular, his work focuses on planning for the transition from fossil fuels to renewable energy, and in creating bridges between labor, environmental, and environmental-justice groups in California and other states. Prior to joining the Labor Center in 2016, Collier was a consultant to environmental nonprofits and foundations on a variety of issues related to renewable energy and climate policy, and he spent 16 years as a staff reporter for the San Francisco Chronicle, covering international news, energy, and climate policy. Tom Dalzell is the business manager for Local 1245 of the International Brotherhood of Electrical Workers, a union representing nearly 20,000 workers in the electric utility and related industries. He began work for IBEW Local 1245 in 1981 as staff attorney. With his appointment to senior assistant business manager in 2001, Dalzell assumed overall responsibility for directing the union’s staff, while continuing to be directly involved in many of the union’s contract negotiations. In 2006, Dalzell was appointed business manager by the union’s executive board, and in 2007 was elected to his first full three-year term by the union’s members. He was re-elected in 2010, 2013, and again in 2016. Alana Dave works as education officer for the International Transport Workers Federation (ITF), a global union federation representing all transport sectors including road, rail, maritime, and aviation. Currently there are over 650 transport unions affiliated from around the world. Dave leads the ITF’s global program on public transport. Cesar Diaz has served as legislative and political director for the State Building & Construction Trades Council (SBCTC) since 2010, and had previously served as deputy legislative director since 2006. The SBCTC represents approximately 450,000 construction workers across California who belong to 180 individual local trades unions. As legislative and political director, Diaz manages the SBCTC legislative agenda to ensure its priorities are advanced. In addition, he is responsible for monitoring statewide regulatory agencies that may impact SBCTC members. Cecilia Estolano is co-founder of Estolano LeSar Advisors and a member of the University of the California Board of Regents. She is a foremost expert on contemporary urban planning issues ranging from economic and workforce development to land use, environmental equity, and urban revitalization for cities and communities across the country. During her nearly 30-year career, she has worked directly with public, private, institutional, and nonprofit clients to plan, finance, design, implement, and operate policy-driven programs and projects that promote sustainable solutions tailored for each community. In addition to her work on the UC Board of Regents, Estolano has served as president of the California Community College Board of Governors and many other boards and commissions. Mike Fishman, with Climate Jobs NY, was the secretary‐treasurer of the Service Employees International Union from 2012 to 2016, a position to which he was elected after serving more than 13 years as the president of SEIU Local 32BJ. The grandson of a union carpenter who taught him the trade, Fishman’s career as a labor activist began when he joined the carpenters’ union. After nearly 20 years in that union, during which he served as director of organizing, he joined SEIU in 1996 as assistant to the president and then chief of staff. Fishman’s success as a labor leader is grounded partly in his understanding that labor, business, and government can work cooperatively to spur economic growth and create a broadly shared prosperity. Richard France is a strategic planner and thought leader at Estolano LeSar Advisors, where he has been involved in a variety of active transportation, transit-oriented developments, and equitable economic development projects. France authored the LA2050 Report, which assessed the health of the Los Angeles region based on indicators of human development and put forth a vision for a more inclusive and prosperous LA. His work in active transportation includes coordinating a study to improve bike and pedestrian access to transit-oriented districts for the County of Los Angeles, and working with the Southern California Association of Governments to host tactical urbanism events throughout the region. Hans-Christian Gabrielsen is general secretary of the Norwegian Confederation of Trade Unions, to which he was elected in 2017. From 1996 to 2000, Gabrielsen worked for the Fellesforbundet union in the negotiation department, where he worked on the treaties for wood processing, construction, and the glass industry. He was chairman of the Labor Party from 1999 to 2001, deputy chairman of the Buskerud Labor Party from 2001, and has been a member of the National Board of Labor and the party’s EU committee. The Honorable Eduardo Garcia serves in the California Assembly representing the state’s 56th Assembly district, which includes cities and unincorporated communities in eastern Riverside County and Imperial County. Elected in 2014, Garcia was the author of the landmark AB 398 in 2017, which extended California’s cap and trade system through 2030. His Assembly committee appointments include the Joint Legislative Committee on Climate Change Policies, which he chairs. Alyssa Giachino is senior research/policy manager with the United Auto Workers, which represents more than 400,000 workers in auto and parts manufacturing as well as public sector, health care, and nonprofit workers. The UAW has a proud history of bargaining health care and job training benefits for workers as well as active leadership in civil rights battles since the 1950s. Giachino has more than a decade of experience in the labor movement, supporting organizing for low-wage private sector workers in manufacturing, hospitality, and building services. Jamaine Gibson, with Amalgamated Transit Union Local 265, joined Santa Clara Valley Transit Authority (VTA) in 2011. After working for ten years with New United Motor Manufacturing, Inc., where he served as a safety representative for UAW, he was forced to find new employment when the auto plant closed its doors. He joined VTA as a coach operator where he participated in the Joint Workforce Investment (JWI) program. Gibson became a mentor for new employees and seven years later, he continues to mentor and has now evolved to a JWI apprenticeship coordinator. He has enrolled over 200 new apprentices in four different apprenticeship programs, which include coach operators, service work to service mechanics, track workers, and the overhead line. Gibson specifically works with the coach operator apprenticeship by way of conducting training classes, organizing upcoming trainings, hosting events that continue to support mentorship within VTA, and a multitude of other projects. John Harriel, otherwise known as “Big John,” is a project superintendent for Morrow Meadows Corporation. He has been with the International Brotherhood of Electrical Workers Local 11, as well as employed at Morrow Meadows, for 21 years. In 2003, Harriel graduated the apprenticeship as valedictorian, with perfect attendance. He is also a facilitator and board member of 2nd Call, a nonprofit organization that specializes in re-entry and getting proven-risk individuals into careers in the south Los Angeles area and surrounding communities. Rusty Hicks is the president of the Los Angeles County Federation of Labor, AFL-CIO. He is one of the youngest—and the first post-9/11 war veteran—to lead one of the nation’s largest labor federations. Raised by a single mother in Fort Worth, Texas, Hicks saw first-hand the challenges of attaining the American dream. His mother’s hard work inspired Hicks to a life of service. He is a lieutenant in the United States Navy Reserve and a veteran of the war in Afghanistan. Hicks is a member of the Los Angeles College Faculty Guild–America Federation of Teachers Local 1521. Jeff Hunerlach is an operating engineer who worked for 25 years in the construction industry before becoming a member of the Operating Engineers Local 3 staff as a business agent. He has worked for nine years as a union representative, beginning in the Yuba City area and then being promoted to district representative for OE3 in Humboldt and Del Norte Counties in 2016. Hunerlach currently sits on the Workforce Development Board as well as the Water Resource Planning Advisory Committee, both of Humboldt County. He serves as a delegate to the Central Labor Council of Humboldt and Del Norte Counties, and as Secretary-Treasurer for the Building and Construction Trades Council of Humboldt and Del Norte Counties. He is also a delegate to the California State Building Trades. Jeff Johnson was elected president of the Washington State Labor Council, AFL-CIO, in 2010. Johnson joined the WSLC staff in 1986, and has served as special assistant to the president, lead lobbyist, research and organizing director, and as shop steward for his staff unit, which is part of Office and Professional Employees International Union Local 8. His work at the Washington State Labor Council has focused on legislation that improves the lives of working people through increasing collective bargaining and organizing rights; economic justice and anti-poverty measures; strengthening workers’ compensation, unemployment insurance, and employment standards; improving the health care system; and protecting the rights of farm workers and immigrant workers. Betony Jones is principal at Inclusive Economics LLC. Her career has focused on identifying job and equity impacts, investment opportunities, and economic development potential of decarbonization. Jones’s ability to connect big picture ideas with pragmatic implementation strategies has been put to use designing and launching innovative energy efficiency programs; strategy consulting with foundations, nonprofit organizations, local and state governments, and energy utilities; and conducting groundbreaking research to support California’s ambitious climate policies. Sheheryar Kaoosji, founding co-executive director of the Warehouse Worker Resource Center, has been leading the research and organizing in the warehouse industry of the Inland Valley since 2008. Kaoosji leads the research and policy analysis for the organization, as well as the WWRC’s civic engagement and community organizing programs. He has over two decades of experience engaged in research in support of organizing in California. Bernie Kotlier is the executive director of Sustainable Energy Solutions for the California Labor Management Cooperation Committee (LMCC), a joint effort of the National Electrical Contractors Association (NECA) and the International Brotherhood of Electrical Workers in California. He directs the development, promotion, and delivery of sustainable energy business development programs, education, and training for IBEW electricians and electrical contractors who are members of NECA in California and Nevada, including energy auditing, energy efficiency, photovoltaics, zero net energy buildings, electric vehicles, energy storage, and micro-grids. Mark Kyle is the director of government affairs for Operating Engineers Local Union No. 3, the largest building and construction trades local in North America representing over 37,000 private and public sector workers Hawaii, California, Nevada, and Utah. Besides legislative and policy work, Kyle oversees and directs campaigns at the local, state, and federal levels. Among other projects, his work includes organizing and advocacy on climate adaptation and mitigation projects such as Measure AA, the San Francisco seawall restoration, off-shore wind energy production, and high-speed rail. Irene Lanzinger was elected president of the British Columbia Federation of Labour (BCFED) in 2014. The BCFED represents more than 500,000 working people from affiliated unions across the province, in every sector of the economy. Lanzinger is the first woman to be elected as president of the BCFED. She has a long history as a strong leader in the labor movement and is deeply committed to advancing equality, protecting vulnerable workers, and strengthening workplace safety. She joined solidarity delegations in Namibia and across Latin America, including Guatemala, Honduras, Panama, and Colombia. Zoe Lipman directs the BlueGreen Alliance’s Vehicles and Advanced Transportation Program and the organization’s policy and research on related emerging technology, manufacturing, and economic topics. Prior to joining BGA, Lipman headed National Wildlife Federation’s policy and advocacy on fuel economy and advanced vehicles, and previously led NWF’s Midwest climate policy program. Lipman has written on advanced vehicle supply chains, transportation and utility sector innovation, and the automotive recovery. She has served on utility, transportation, and climate policy forums at a state, regional, and federal level, and works closely with labor, environmental, business, and government stakeholders. Shawn McCloud is assistant business manager of the International Brotherhood of Electrical Workers Local 18, representing members in the union’s clerical, professional, supervisory, technical, and business administrative units. Embracing the joint labor management concept, McCloud was tasked with implementing the Utility Pre-Craft Training (UPCT) program. Working under the leadership of IBEW Local 18 business manager Brain D’Arcy, McCloud was the leading labor force behind execution of the UPCT program. She has been a mentor, advocate, and architect of the program since its inception in 2011. The UPCT program has become a model for coupling green investments with career path jobs for disadvantaged communities. Gil McGowan is president of the Alberta Federation of Labour, and has presided over a period of substantial growth for the AFL. He has led public discussion and policy changes on many important issues, including resource development, reform of the temporary foreign worker program, climate change and green jobs, a $15 minimum wage, pension reform, reforms to the labor code and employment standards, and reforms to occupational health and safety and workers’ compensation legislation. McGowan also sits on the CLC’s Canadian Council and was co-chair of the Energy Diversification Advisory Committee (EDAC), a special committee established by the Alberta government to make recommendations for adding more value to Alberta’s energy resources. He has recently been appointed to the Federal Just Transition Task Force to support transition strategies for workers and communities affected by the phase out of coal-fired electricity across Canada. Sharon Modiba is a senior research economist with the National Union of Metalworkers of South Africa (NUMSA), as well as a wife and a mother to a 15-month old baby boy. She currently resides in Centurion-Pretoria, South Africa. At Numsa, Modiba represents labor interest in the manufacturing sector—energy, automotive, petroleum, mining, and related sectors—and in the Numsa Parliamentary office. As a researcher, she seeks to improve the material conditions of the working class and the lives of ordinary South Africans. Rebecca Newberry is executive director of the Clean Air Coalition of Western New York. She has more than ten years of experience in developing and managing successful issue campaigns, including environmental enforcement, climate and energy policy, and state budget legislation. Newberry is a strong facilitator, trainer, and coalition builder with multiple successes in building programs and teams from the ground up, managing and supporting people through coalition tensions, and demonstrating a passion for strategy and collaboration. Her work with Clean Air has been featured in national and international publications such as Grist, Mother Jones, Bill Moyers, and Al Jazeera. Sebrina Owens-Wilson is campaign director at the Partnership for Working Families, where she leads work in the areas of climate justice, equitable infrastructure, transit equity, and campaign research. For more than nine years she has worked with Partnership affiliates to advance a vision of a clean and just economy that delivers widespread economic opportunity and leaves a healthy planet for future generations. Owens-Wilson has also helped shape the organization’s position as a national expert on creating family-sustaining jobs in the construction and waste and recycling industries. Erika Thi Patterson, with Jobs to Move America, has been a life-long rabble-rouser. She negotiated the first-ever community benefits agreement with electric bus manufacturer BYD, and led a good jobs campaign with a community-enviro-labor coalition to win a Manufacturing Careers Policy at LA Metro. She also co-led a comprehensive zero emission bus policy campaign at LA Metro with a coalition of labor and environmental organizations. Art Pulaski is the executive secretary-treasurer and chief officer of the California Labor Federation, AFL-CIO, which represents 2.1 million members of 1,200 manufacturing, transportation, construction, service, and public sector unions. Pulaski’s career in organized labor began at age 16, when, as a supermarket clerk, he joined the Amalgamated Meat Cutters Union. As leader of the Labor Federation, Pulaski has built more political activism for the grassroots and new political technologies to help unions win important elections. Under his leadership, the Federation has helped to elect worker-friendly candidates to the California legislature and other statewide offices. Pulaski has served on numerous gubernatorial panels and commissions on economic progress and workforce development. He was a founder of one of California’s model childcare centers, called PalCare, and served as president of the nationally televised PBS series “We Do the Work,” the Labor Project for Working Families, and the California Works Foundation. Brian Rice is president of California Professional Firefighters, representing more than 30,000 frontline first responders in nearly 180 local unions. California born and raised, Rice spent more than three decades as a firefighter with the Sacramento Metropolitan Fire Department, advancing to the rank of deputy chief of operations. He spent 25 years on the executive board of Sacramento Area Firefighters Local 522, including 12 years as president. He served as CPF’s 3rd district vice president and is the IAFF’s 10th district state field representative for California. Rice has also served 12 years as president of the Sacramento Firefighters Burn Institute, a charitable burn foundation founded and led by union firefighters. Barbara Sattler is a registered nurse and a professor of Nursing and Health Professions at the University of San Francisco, where she is a member of AFT Local 4269. She is a founding and active member of the Alliance of Nurses for Healthy Environment, an international organization that is helping to integrate occupational and environmental health into nursing education, practice, research, and policy/advocacy. Sattler has worked at the local level in communities facing environmental health risks associated with lead poisoning, pesticides, Superfund sites, and health effects from gas and oil extraction. Lara Skinner is associate director of The Worker Institute at Cornell University and chair of the institute’s Labor Leading on Climate Initiative. Her research, writing, and labor education work focus on workers’ and labor unions’ engagement in issues of sustainability, climate protection, and economic alternatives. She began her career in labor working with Oregon’s farmworker union (Pineros y Campesinos Unidos del Noroeste). She also worked at the University of Oregon Labor Education and Research Center, and was an active member of the Graduate Teaching Fellows Federation, Local 3544. Samantha Smith is a lawyer and activist, and the director of the Just Transition Centre, an initiative of the International Trade Union Confederation and partners. Smith has worked on climate, energy, and social justice issues for more than two decades. Most recently she led the World Wildlife Fund’s global climate and energy team, with responsibility for international climate change negotiations, campaigns, renewable energy advocacy, engagement with business, and civil society and movement partnerships. She has served on various international expert groups and task forces on climate and energy. Willy Solorzano has been with International Association of Sheet Metal, Air, Rail and Transportation Workers (SMART) Local 105 since 2004 when he started the apprenticeship program, which he completed in 2009 and graduated with perfect attendance. Solorzano continued as a journeyman until 2013, when he was given the opportunity to work with the SMART LOCAL 105 staff as a union organizer working the North Los Angeles area. His scope of work included ensuring non-union employers were following labor laws and that, in instances where non-union employers bid for and were awarded a union job, they were honoring the union contract. Hunter Stern supports anything that produces new jobs for his union’s members. As the business representative for the International Brotherhood of Electrical Workers Local 1245, Stern is responsible for protecting the interests of his constituents, including contract enforcement, grievances, labor-management negotiations, and general contract bargaining. Through his 20 years of work with the IBEW, Stern has built extensive knowledge of the state electricity deregulation, energy, and water issues which currently face San Francisco. Cathy Stoddard, with SEIU Nurse Alliance, has been a staff nurse at Allegheny General Hospital since 1992. She is a past president of the Registered Nurse Union at Allegheny General Hospital, SEIU Healthcare, and served on the executive board of the statewide SEIU Healthcare Pennsylvania for 18 years. Stoddard is an elected member of the National Nurse Alliance Executive Committee of SEIU, and has also served as its policy chair. She presented for the 40th anniversary of OHSA and has testified at the Department of Justice, the Federal Trade Commission, and the National Vaccine Advisory Committee hearings in Washington DC on behalf of patients and nurses. JB Tengco is the West Coast director for the BlueGreen Alliance. Previously, he has worked in the labor, clean energy, and political arena, including in the California Democratic Party and the California Labor Federation, AFL-CIO. Richard Trumka is president of the 12.5-million-member AFL-CIO. An outspoken advocate for social and economic justice, Trumka is the nation’s clearest voice on the critical need to ensure that all workers have a good job and the power to determine their wages and working conditions. He heads the labor movement’s efforts to create an economy based on broadly shared prosperity and to hold elected officials and employers accountable to working families. Trumka’s economic advocacy extends from the kitchen table and spans the globe. He has rallied international labor support for workers struggling for justice, and he has fought to end unfair trade practices and restore U.S. manufacturing strength. As secretary-treasurer, he carved out an innovative leadership role that continues today, working with programs that invest the collectively bargained pension and benefit funds of the labor movement to ensure they serve the long-term interests of workers. Steve Viscelli is a sociologist at the University of Pennsylvania, where he is also a Robert and Penny Fox Family Pavilion Scholar and a Senior Fellow at the Kleinman Center for Energy Policy. His research focuses on labor and energy in freight transportation. In 2016, Viscelli published The Big Rig: Trucking and the Decline of the American Dream, a book about the work and fortunes of long-haul truck drivers. His current research is on the impacts of self-driving trucks on labor and the environment. Sarah L. White is the deputy director for Equity, Climate and Jobs at the California Workforce Development Board, where she is charged with aligning the state’s jobs and training agenda with its climate and environmental goals. Before joining the administration of Gov. Jerry Brown, White spent a decade at COWS, a national policy center at the University of Wisconsin dedicated to high-road economic development. Her work in California focuses on the intersection of labor, education, and climate policy at state and federal levels, and she is a national expert on jobs and training in the clean energy economy. White has written widely on inequality, decarbonization, and social change, including the report Greener Reality: Resilience, Equity, and Skill Formation in a Cleaner U.S. Economy. Yvonne Williams is president of Amalgamated Transit Union Local 192 and president of the Alameda Labor Council. She began her career in transportation in 1980, as an interstate transit operator for Greyhound Lines Bus Company; that is when she first became a member of the Amalgamated Transit Union, AFL-CIO (ATU) Local 1225. In 1986, Williams joined ATU Local 192 as a transit operator, and in 1999, the members elected her as their shop steward. After serving six years in this capacity, she was elected president/business agent of ATU Local 192, where she is currently in her fourth three-year term of office, representing members at AC Transit, National Express, and A-Paratransit. As president, Williams is the chief executive officer of ATU Local 192 and is responsible for the daily operations of the union. Marguerite Young is coordinator of the Climate and Environmental Justice Program of Service Employees International Union, where she guides implementation of SEIU’s climate equity and environmental justice program. She also serves on the board of the East Bay Municipal Utility District, California’s second-largest water utility. Young is a lifelong activist with more than three decades of accomplishment and leadership as an organizer, policy advocate, and coalition builder on behalf of the environment and workers. She is a subject matter expert in water quality, climate equity, and responsible investment practice. Young serves on the boards of Carpe Diem West and Clean Water Action, where she was formerly California director. Carol Zabin directs the UC Berkeley Labor Center’s Green Economy Program. She is a labor economist and an expert in low-wage labor markets, labor standards, and workforce development. Over the last ten years Zabin has authored numerous reports on labor and California climate and energy policy for the California Public Utilities Commission, the Labor Agency, and others. She serves on the California Workforce Development Board and has consulted for state agencies, elected officials, unions, foundations, and community organizations on strategies and policies to improve jobs and skills in the green economy. Zabin is the lead author on the workforce report mandated in AB 398, which will provide recommendations to the state legislature on workforce and jobs strategies related to California’s climate policies and programs.